Only one game stands tall across both platforms. You don't need to perform a super human feat to dominate iOS and Android. Just release a quality game on Google Play and the App Store. Turns out, Marvel did exactly that, captivating our attention in the process. In order to succeed with episodic games, you must keep fans hungry for more. Marvel took a step in that direction with Avengers Initiative, a 3D beat-em-up that takes its inspiration from Chair Entertainment's Infinity Blade franchise. Available for $6.99, the first episode sends The Incredible Hulk on a mission to track down a handful of villains that escaped a top-secret S.H.I.E.L.D. facility. That said, players control the green monstrosity as he throws down with the likes of Abomination and Wendigo. 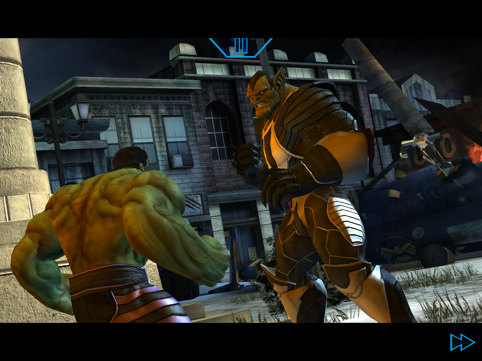 User-friendly controls make dodges and punches a breeze, while rage attacks and finishers bring out the Hulk's best. Throw attention-grabbing graphics, impressive voice acting and upgrades into the mix, and you have a comic book recipe for success. The fact that future episodes star Iron Man, Captain America and Thor have us drooling.